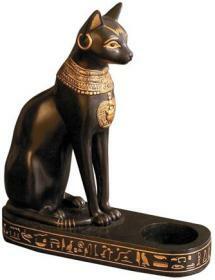 Legends of cats and witchcraft have origins in ancient Egypt. The cat was revered in ancient Egypt, condemned in the Middle ages, and has been credited for having a connection to other realms. In Bubastis, cats were thought to be a goddess incarnate and were treated as such. Legends of witches have been largely misconstrued and colored by the oppression of the Christian churches... during the Middle Ages especially. Unspeakable tortures were inflicted on people thought to be using sorcery, as this challenged their interpretation of the Christian bible. It was said that these "witches" practiced the ancient religions of gods and goddesses, and had learned the "trickery" of shape shifting into other animals, particularly cats. Many of these religious leaders believed that cats by their very nature were evil and sent from the Devil himself to assist witches in their "evil deeds". The belief in cats as having otherworldly powers did not start with the agendas of the religious zealots of the European Middle Ages... although they can certainly be credited for any negative connotation. In ancient Egypt, the cat (or "mau" as it was known) was respected as a great hunter and useful for keeping rodents away. Cats in and of themselves were not worshipped, however the ancient city of Bubastis which is a short distance northeast of Cairo along the Nile, named itself after the feline goddess Bastet. This goddess is often represented as a cat, and indeed, many ancient Egyptians believed that domesticated cats represented this goddess of fertility and protection. Therefore cats in ancient Egypt had privileges that other household pets did not... including the freedom to come and go at will. 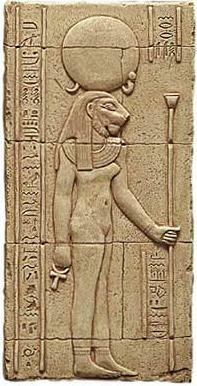 There were other deities in ancient Egypt that had a feline form... however they were generally depicted as having the head of a female lion (Sekhmet, the goddess of war, is an example of one). It is believed by many that the city of Bubastis especially put great significance on cats as a whole. This is evidenced by the many statues and representations of cats among the ruins of this city, as well as the ruins of a temple built in Bastet's honor. Many Egyptian tombs have mummified cats buried along with the people there... showing their significance as protectors. Women would pray to the goddess daily for blessings of fertility for their families. Bastet's form was generally that of a lean graceful feline, or at times, half human and half cat. Hundreds of years before Jesus is believed to have been born... Bubastis, along with the rest of the cities of ancient Egypt, fell at the hands of the Persians. It is said that one of the reasons for the devastating loss was the reluctance on the part of ancient Egyptian warriors to strike the Persian shield... whose coat of arms contained the rendering of a cat. Even before this defeat, there were teachings from the very people Egypt had enslaved for so many years... the Hebrews... that were gaining strength. These teachings went completely against the worship of many deities and the edification of animals that had been the norm for so long. The notion of more than one God came to be seen by a growing number of people as being "evil". Anyone who continued to worship these gods and goddesses became thought of as blasphemous... and the term "pagan" which had meant "country dweller" came to mean anyone who didn't believe in one God... and "goddess" wasn't even part of the equation. The matriarchal society was not accepted, as women were told to step back and let the men make the final decisions. The legends of what we have come to know as witchcraft have many origins in the beliefs of the ancient Egyptians. One of the most common threads is that of balance... not one male dominated God but the working together of male and female. Rather than females being relegated to the role of a helpmate always deferring to the male... they were revered as representations of life, much as Bastet was. Fertility was respected rather than expected. There is also the study of shape-shifting. 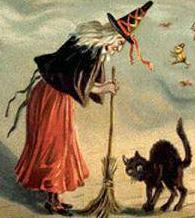 Many legends of witchcraft involve the ability to change into another living creature at will. The Egyptians also studied this, and there was a belief among many at the time that domestic cats were actually products of Bastet directly. The cat in and of itself was not worshipped in either Egyptian or witch folklore... however, the belief in cats being able to "see" beyond this world has similarities. This belief was intentionally misconstrued by many Christian leaders, especially in the Middle Ages. Locals in villages all over Europe and in parts of colonial America fell under a mass hysteria of irrational fear of witchcraft perpetuated by the church. Anyone thought to be a witch was captured, given a mockery of a trial, and executed. The belief that cats were "familars" of witches and could possibly be witches shifted into cats led to these witch hunters rounding up cats by the hundreds. These cats met the same fate as their human counterparts. Whether the cat was revered as it was in ancient Egypt, or condemned as it was in the Middle ages, it is clear that this animal has been credited by many for having a connection to other realms. In Bubastis, cats were thought to be a goddess incarnate and were treated as such. In later years during the witch trials in Europe and America, cats were thought to be witches incarnate... and were killed. Ironically... if they hadn't destroyed those cats, the rodent population may have stayed under control... and the Black Plague wouldn't have taken so many lives! Equally ironic is that legends of cats being revered, fertility, and goddesses walking side by side with gods were so readily named "evil" by religious leaders killing in the name of God. Get ghost stories and interesting news and information about the paranormal and the strange. Absolutely no-spam - just great stuff to read. The True Ghost Tales Newsletter is now being managed by FrogPressNews. The following link will land you on the sign up page. After you sign up you will receive a confirmation request by email. You will need to click the link in that email to confirm your subscription. Get the True Ghost Tales Newsletter today! Our Ghost Stories are updated every day with new ghost stories, paranormal articles, and all sorts of strange and ghostly stuff. These is also an old ghost story archive. The archive represents an older section of True Ghost Tales which contains nearly 200 stories. Here are just a few of the ghost stories and paranormal related articles on this site. Be sure to bookmark True Ghost Tales so you can come back to read the new stories. Applicable content copyright 2007 ~ 2012 True Ghost Tales. All rights reserved. Unless otherwise indicated content is written by David Slone and may not be copied in any format without permission. If you use True Ghost Tales for research please reference it and its URL http://www.trueghosttales.com. Images presented here are believed to be in the public domain unless a copyright notice is given, if we have made an error please contact me with information. I will accredit the image or have it removed.